It's massive and it's the longest in more than a decade. The soon-to-arrive King Tide, when high tide is at it's highest is about to bring the red tide, already wreaking havoc, even closer inland. According to AccuWeather.com, “King Tide is a very high, high tide that occurs when the sun, moon and Earth are aligned and the moon is at its closest to Earth,” Stephanie Kettle, a spokesperson from the MOTE Marine Laboratory and Aquarium, said. "Although the King Tide would affect the Atlantic coast more so than the Gulf Coast, the increase in tidal range will still result in a larger volume of gulf water entering the estuaries, and that could push populations of K. brevis further into the estuaries and bays. This would also increase the salinity of estuaries and bays." Red tide is a harmful growth and concentration of microscopic algae, a natural occurrence in bodies of water around the world. In the Gulf of Mexico, the red tide is caused by Karenia brevis (K. brevis), a native species to the Gulf. The algal blooms can turn the water reddish brown and often kills fish and other marine animals, such as dolphins and manatees. 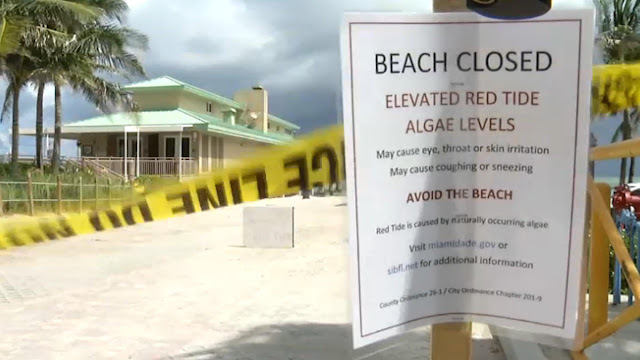 Along with the terrible smell, red tide also brings respiratory concerns for residents, particularly those with asthma. Symptoms of the respiratory irritations include an itchy throat and coughing, which has become known as the "red tide tickle."